Director: John Llewelyn Moxey / Writer: Joseph Stefano / Cast: Eleanor Parker, Sally Field, Jill Haworth, Jessica Walter, Julie Harris, Walter Brennan, John Fink. Psycho screenwriter Joseph Stefano penned this star-studded made-for-TV proto-slasher, which gives new meaning to uncomfortable festive family get-togethers. Dying patriarch Benjamin Morgan instructs his eldest daughter, Alex, to gather her three sisters at the old family ranch for Christmas before he succumbs to his old age. So to the house cometh acid-tongued, trice-divorced Jo, pill and booze swilling Freddie, and sweet-natured youngest Christine, none of whom have been back to the house in some years. Ben tells his offspring that his new wife, Elizabeth, is poisoning him to death. While Alex can’t decide if this is a desperate male-pride rejection of his age, or true due to the gossip that the woman poisoned her previous husband, the other sisters are a little more black and white, with only Christine willing to get to know her stepmother. Before long, Jo decides to leave and is hijacked by a rain-macked, pitchfork-toting assailant outside. The next day, Freddie is drowned in the bath, a tragedy written off as either suicide or an accident waiting to happen. But suspicion runs rife and the remaining sisters can’t help but suspect Elizabeth, more so when Christine is chased through the woods by the rain-mack figure, the very coat belonging to Elizabeth. Giallo-tastic. 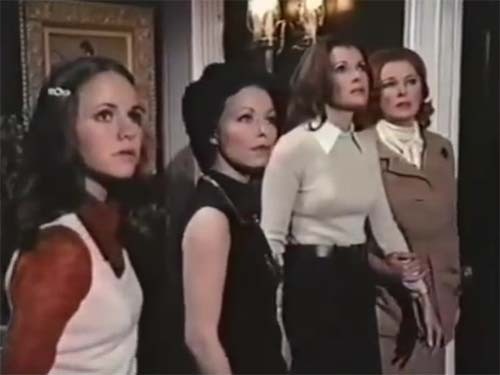 On TV in 1972, this mystery might’ve been a head-scratcher, but with hundreds of slasher films between then and when I saw it this week, it was no more difficult to solve than a Scooby Doo episode. Home for the Holidays has barely a drop of blood, no real horror, and, at a thin 74 minutes, tends to drag here and there – it’s certainly not Black Christmas - but the winner here is the casting: Parker, Walter, Haworth, and Field are all on form as the sisters Morgan. The former two were reunited for another TV sort-of slasher film in 1979 in She’s Dressed to Kill, and it’s easy to see why Sean Cunningham was keen on Sally Field donning the lead role in Friday the 13th, her means-well good-girl vibe and screamability is quite similar to Adrienne King’s take on Alice, albeit with less fighting back required, though it’s worth noting Field would’ve been in her mid-thirties by then. It’s rare to see such a competent collective of actresses working together. Menfolk are sidelined into virtual irrelevance by the film – it belongs to the quintet of leading ladies. Amusingly, Parker was older than the woman playing her father’s new wife, plus old enough to be Field’s own mother! A mild, bleakly festive affair (hey, there’s a tree and a wreath! ), with more in common with Murder, She Wrote than Silent Night, Deadly Night but intriguing in its own way and could benefit from a decent remake. If you want a fun game, count the number of ominous zooms used to create suspicion. I have this on my to-watch list for a long time! Have a Happy Christmas, Hud! No worries, mate. I’m sure the big heads will figure it out eventually!